A kitchen is where memories are made. It’s more than a place to prepare meals. It’s where you take the time to nourish your body and soul. It’s where the family comes together after a day apart. We want you to enjoy every moment in your kitchen. To help you make the most of every day, we created a guide that will help you make your kitchen the heart of your home. Eat at the table or on the couch? Eat your meals wherever you want. You can relax and have conversation at the table. It’s okay to be indulgent and eat mindlessly in front of the TV now and then. You can enjoy a cup of tea standing at the kitchen counter and take a few moments to yourself. There are no rules! Eat wherever you feel like eating. Create a breakfast bar in your kitchen to make an informal space to eat a meal. It’s a simple way to enjoy a breakfast together before the day starts. We love how cozy it can be to sit at the kitchen island with a cup of coffee and forgo setting the table. It puts the focus back on the kitchen as the heart of the home. Having a kitchen island is a way to involve everyone in cooking. It creates enough counter space for all your sous chefs to work at their stations without getting in the head chef’s way. 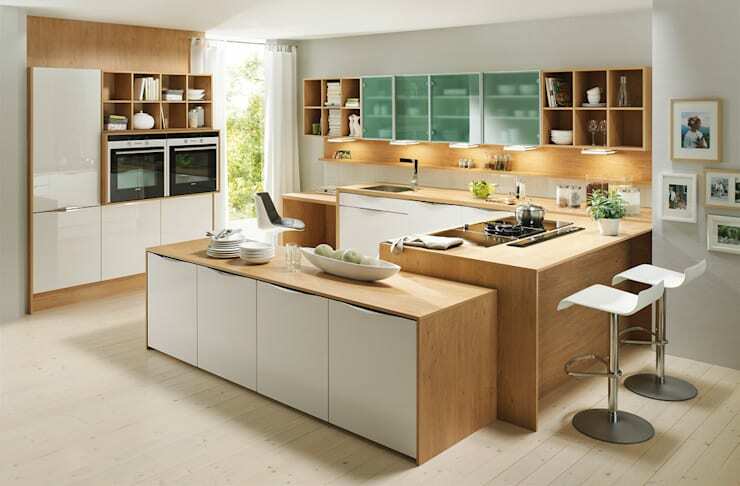 It creates flow and harmony in any kitchen. If you can stand to be this modern, skip the dining room entirely and use an eat in kitchen. It saves space and creates a social hub for the home. 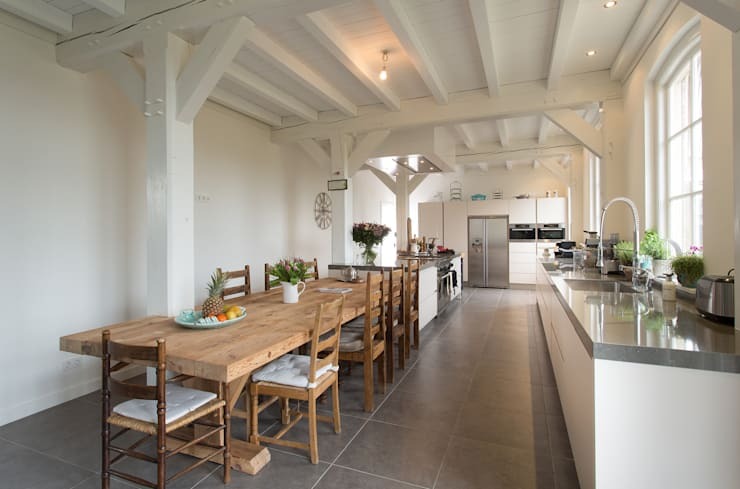 A long kitchen table like this is an inviting space. Everyone can use it, whether they come there to do their work or eat their breakfast. 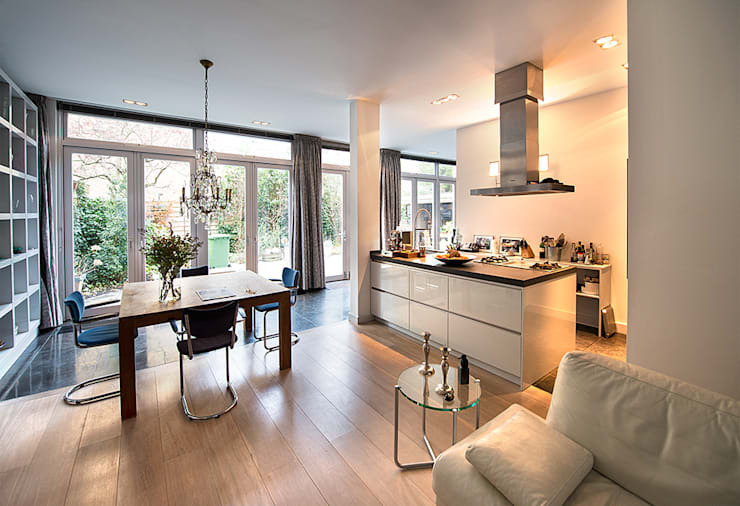 An open plan in your home will highlight the centrality of your kitchen. 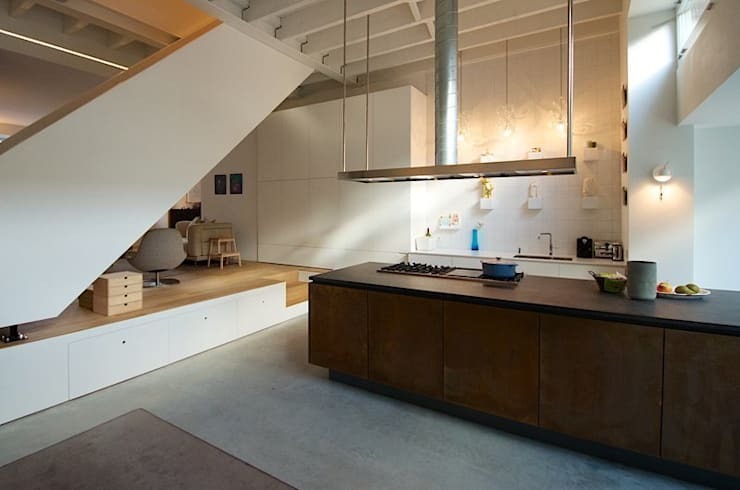 In this room, the living and kitchen spaces are demarcated but have a sense of openness and togetherness. That’s the energy you want to have in your home! 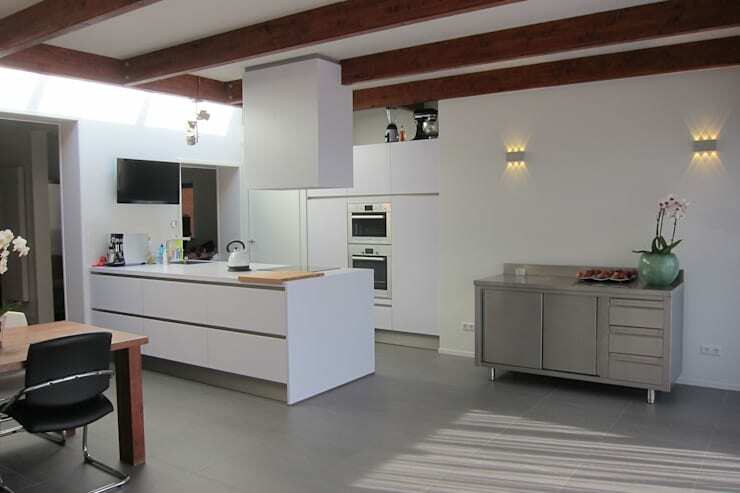 You can get in touch with kitchen planners on homify to get a kitchen that's the heart of your home. Putting a TV in the kitchen means no one will have an excuse to sneak off to the living room to catch the news. This kitchen has a slim and simple screen mounted on the wall so that the TV isn’t the main focus. It’s also a great solution to entertain kids while you put the finishing touches on dinner. Saves you from having to yell at them when it’s ready! 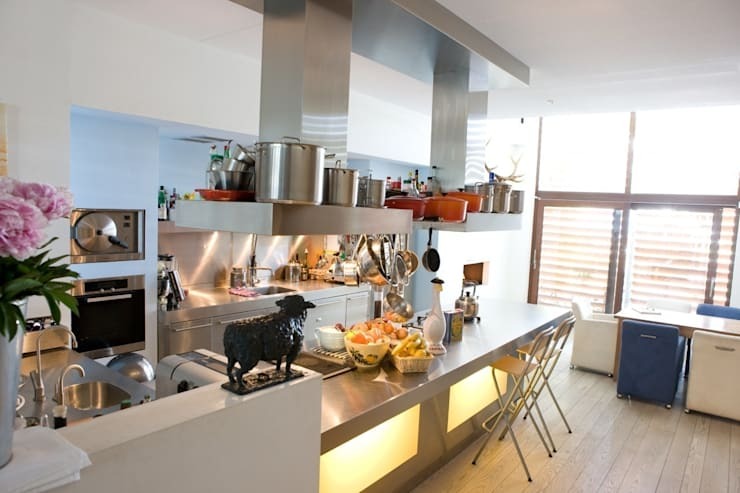 Check out the far wall of this kitchen! Chalkboard paint on a wall is a fun project that boasts a lot of versatility. 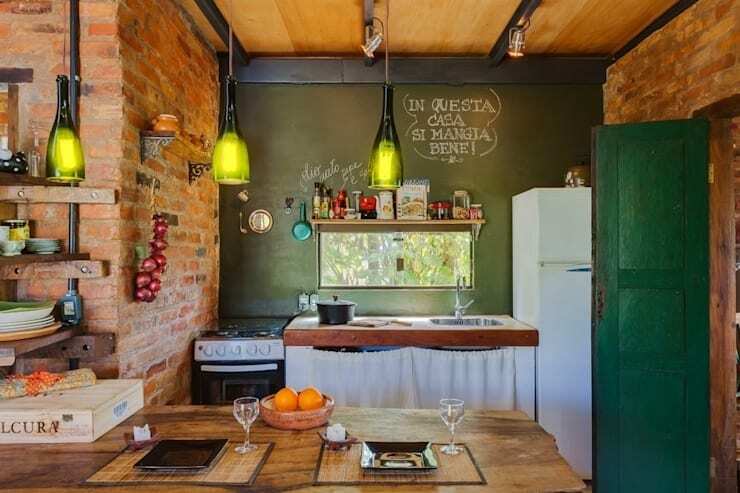 In this kitchen, they use the chalkboard wall to communicate what’s on the shelf! You can use a framed chalkboard, whiteboard, or bulletin board in your kitchen. It’s a space to share your feelings, share information, and keep mementos. Somebody pass the chalk! We hope you enjoyed our guide to making the kitchen the heart of your home. For more kitchen inspiration, check out our feature on 6 things you never thought you could do in your kitchen. How do you make your kitchen the heart of your home?